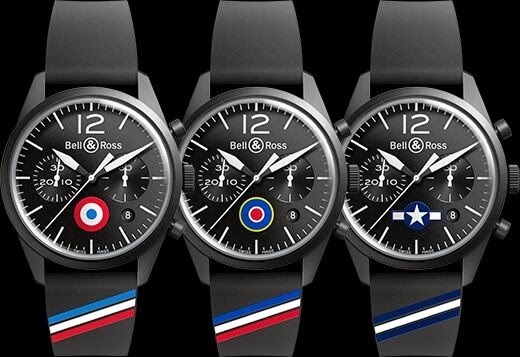 HOROLOGY CRAZY: Bell & Ross Tribute to D-Day Heroes..
Bell&Ross will be releasing 3 watches as a tribute to the D-Day Heroes. The watches, will be based on the BR126 model. The BR126 Insignia will carry on the dial of the watch (at 6 o'clock) the insignia of the nations of the main countries which were involved in WWII. These insignia are the ones that appear on the wings and fuselage of the plane in WWII. These is further displayed on the straps. The watches comes in at 41mm, matte black PVD case. The white hands and index markers are luminous to ensure legibility both during the day and night. To further give the watch a vintage look, a double domed sapphire crystal is used. The watch will be water resistant to 10 ATM. From left, France, UK and USA. I understand the watches will be available from September 2014 and will be distributed only in the countries represented on the dial.